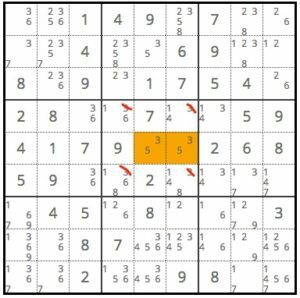 A naked pair occurs on a sudoku board when two cells in a row, column, or box have exactly two candidate numbers left. When this happens, those two numbers can be eliminated from the other cells in the same row, column or box. When you make pencil marks in your puzzle, naked pairs will be very obvious (which is why they are called “naked”). If you see only two numbers in one cell and the exact same two numbers in one of that cell’s siblings, you have found a naked pair. When it happens, any occurrences of those two numbers can be eliminated from the other siblings. The two cells with 5 and 3 in the middle box are a naked pair for the box. All of the other 3’s can be eliminated from that box because one of the highlighted cells must be the 3. In the same puzzle from above, the middle column has a naked pair for 5 and 3. Because those two numbers must appear in the highlighted cells, they can be eliminated from other cells in the column. 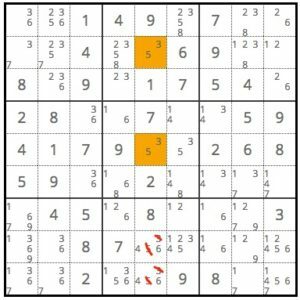 As you can see, finding naked pairs is a useful technique for making progress on a sudoku puzzle. Since this technique does not immediately reveal the number for a cell, it is considered an advanced technique. Advanced techniques usually only help you cross out candidates which will eventually lead to revealing a number.